According to reports directly from the gurdwara management committee, the vandalism happened between the evening of Feb 5th and the morning of February 6, 2012. The graffiti included vulgar language, racial epithets, the use of what appears to be a cross, a large drawing of a gun, and references to the attacks of September 11th. The new site of the gurdwara has been under construction and is due for completion this summer, leaving it uninhabited when the crime took place. 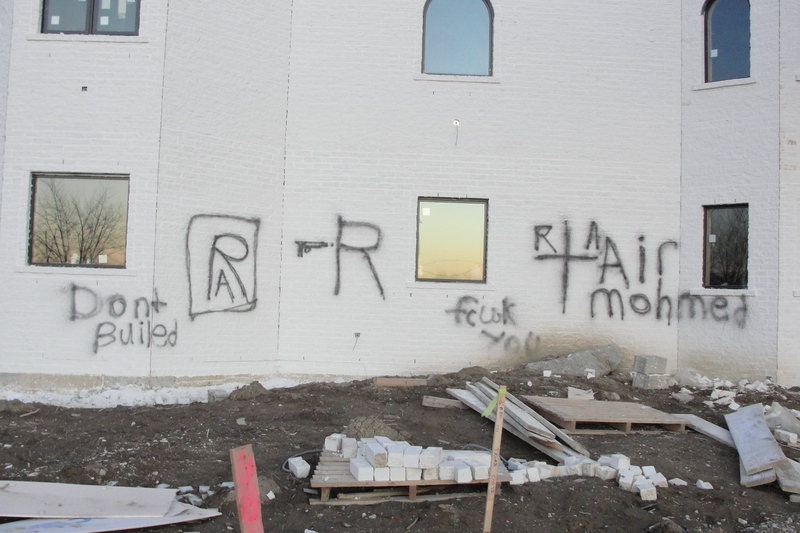 The construction has been ongoing, and recently the exterior had been painted, with the graffiti now taking up a large area on the building’s front wall. The construction of this new Gurdwara is a project started in 2007 by the Sikh Society of Michigan. The graffiti sprayed on the walls of this Sikh house of worship suggests evidence that this was a hate crime targeting Muslims, but it’s no surprise that Sikhs – often confused for Muslims – were the target in this case. Of course, a hate crime against any group is wrong, regardless of the victim or the ignorance of the perpetrators. No suspects have been identified, but SALDEF has called for hate crime charges. The crime is under investigation by the Sterling Heights Police Department, who may be reached at (586) 446-2800. UPDATE: The Michigan chapter of the Council of American-Islamic Relations (CAIR) has also joined in the call to investigate this vandalism as a hate crime.